Wow, this could quite simply have been one of the most amazing meals I have ever had! The starter was startling good, the main course immense and the dessert certainly didn’t let the side down. Without a doubt, our first experience of a meal out at Acorn was a huge success. Situated just the quickest of ambles from the Abbey Churchyard in Bath, Acorn has been creating its award-winning vegan cuisine for four years now, all within one of Bath’s oldest buildings that remains cosy without feeling at all cramped. With the babysitter booked and pizzas ready at home for the children, we’d gone for early 6.30pm sitting, meaning there were plenty of tables to choose from, although these soon filled as the evening progressed. Acorn presented three choices of menu types, one for lunch, two tasters and the Acorns Classic Menu, plus a enticing wine list too. We chose from the Classic and first off a warning – the descriptions simply don’t do the food the justice it most certainly deserves. For example, a starter of ‘An old donkey carrot’ just isn’t that enticing, despite the fact that it’s ‘cooked slowly and then fire charred, truffle, parsley and pickles’, and it needs an explanation from our waiter to fully explain the appeal of the dish. 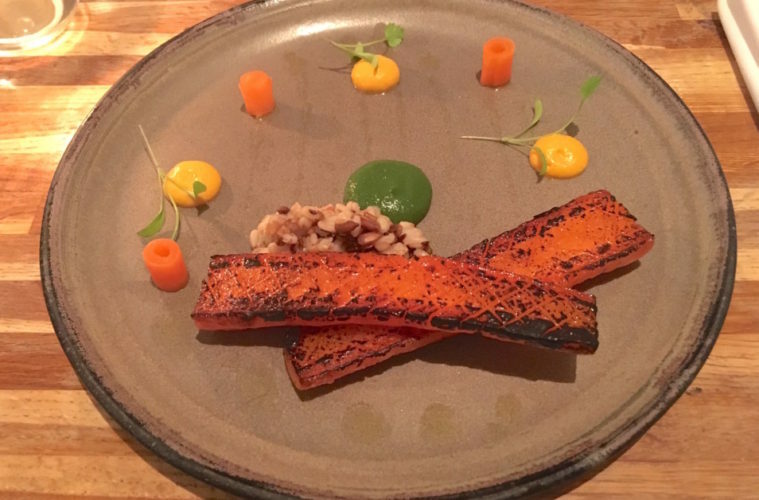 In fact, such was her powers of description that I chose said carrot, with my wife preferring the Broham Beetroots, fine herbs and cultured cashew puree. Well done the waiter. That old donkey carrot (pictured above) turned out to be one of the best starters I have ever tasted, as well as being beautifully presented. The secret, it soon transpired, is to combine each of the elements on the plate to release the full flavour of the dish, with the beautifully cooked carrot just working wonderfully with the purees, pickles and spelt grain mixed with toasted sunflower seeds, caraway, fennel and flax. Each element was OK on its own, but put them together and the result was flavoursome, light yet fulfilling and actually quite perfect. 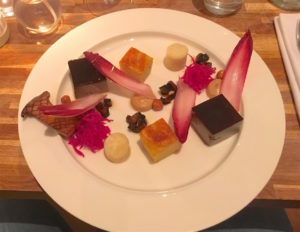 While the beetroot was prepared and presented to a similarly masterful standard, the flavours, while still delicious, just missed out on the dizzy heights of that old carrot, although the cashew puree was once again a work of genius. Two clean plates later, we couldn’t wait to see if the standards so far would extend to the main courses, with me choosing the rich mushroom parfait, celeriac cooked in its juice, hazelnut, potato and chicory, and Ellen the garlic dhal with onions, confit shallots, fried rice fritters and kale. Again, the presentation of both dishes was stunning, with the amount of work involved both here and in the preparation of each element of each course explaining in part the high cost of the food. And again, the result was just superb. The combination of flavours, the quality of each element and the expert appreciation of how each element brings the best out of the others was masterful. Similarly, the dhal was full of flavour and beautifully prepared, if slightly overpowered by the smokiness of the rice fritters. Each dish is partnered with a suggested wine and the Pinotage from the Western Cape which, with its flavours of coffee, chocolate and plum was an ideal partner for the smooth, deep tastes and textures of the food. Following a pause to compare notes and discuss future visits to Acorn, our desserts arrived, a chocolate ganache with coffee parfait cold brew and rapadura gel and pink peppercorn crumb, with Ellen going for the forced Yorkshire rhubarb with olive oil parfait, fennel carpaccio and scots pine. The rhubarb exuded a fresh sweetness that was a perfect conclusion to a wonderful meal, while the rich flavours of the ganache simply showed again the chef’s appreciation of how perfectly to combine elements of a dish to the best effect. Bath is blessed with a rich variety of restaurants, cafes and eateries, and while only a few regularly impress, I have rarely visited one where the food was as impressive – both in terms of presentation and flavour – as Acorn. To focus on the vegan element is almost missing the point – yes, it’s plant-based menu will be crucial for some, but it’s the pure quality of the product, whatever the ingredients, that should really shout out loudest, and here the team from Acorn have earned the right to shout very loudly indeed.